TVF’s Passion Ka Bhoot is i​nspired from TVF’s popular horror comedy series, TVF Bhootiyapa–Bachelors vs. Ghost which made its mark online garnering over 3 million views ….and still counting! 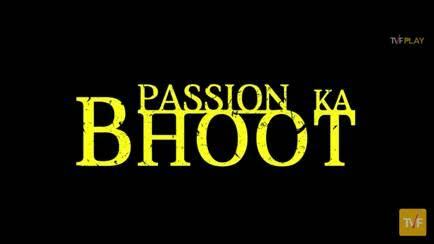 TVF’s Passion Ka Bhoot is ​written by Chandan Kumar and is directed by Harman Wadala​. ​The popular web sketch also stars leading TV & theatre actors — Ashish Verma, Tarun Singhal, Shivankit Singh Parihar, Trupti Khamkar, Ranjan Raj, Sudhir Kumar, Abhinav Anand ​and Anant Singh. ​​​The web sketch is a satirical take on​ the fad of ‘Following Your Passion’ It’s a story about Manu (Ashish Verma) who works ​in an MNC, ​in a standard 9 to 5 job. All is going well ​until, one day he gets transferred to another cubicle in his office, one that is ‘haunted’ by a ‘Passion Ka Bhoot’! And, in the midst of following his passion to ​be​ a photographer, writer, travel-blogger, actor and singer his whole life goes for ​a toss​! The ​web sketch ends with a remarkable note to young Indians — ‘Follow your passion’ in whatever you choose to do! However, whatever ​you decide to do, requires discipline and planning keeping in mind that family security is also important. Moreover, a 9 to 5 job is not ‘detention’, but it helps to discipline you and bring stability in whatever you choose to do. At the forefront of the web series revolution with five​ of India’s most successful releases —Permanent Roommates, Pitchers, Tripling , Humorously Yours and Bisht, Please! ​– with over 100 million views — The Viral Fever (TVF) is India’s premier digital entertainment network. Founded by Arunabh Kumar, Creative Experiment Officer (CEO), the Company is creating headlines globally and within India, revolutionising the way Indians access entertainment. Loved by India’s youth, TVF is a pioneer in the new genre of online entertainment, with a focus on progressive and new-age content.